There are many things on the exterior that need attention. The roof line on this bay window does not have a gutter and does not extend far enough out to let the rain fall on the ground. The entire sill on all 3 windows is rotted from years of water damage. The window units (3) will need to be replaced and have a gutter/roof on it. The flagstone patio is missing some stones. It seems that while the house was empty when the initial construction phase was beginning, several people just came by and helped themselves to some of the loose stones. I'll have to have my daddy build a low deck/platform on the grass just to the edge of the patio. On that platform is where I'll put my hot tub and a canopy over it. Eventually, I'll have the platform extended to where I was standing when I took this picture. 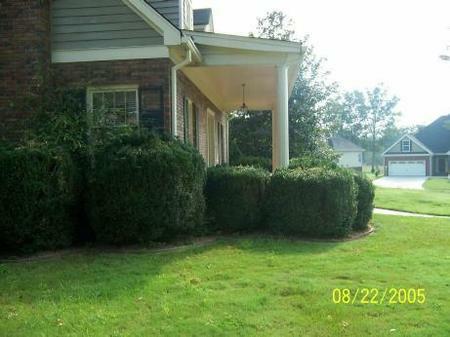 For those of you who know me.....the VERY FIRST THING THAT I'LL DO IN THIS YARD IS GET RID OF ALL THAT IVY. DID I MENTION THAT I HATE IVY???? 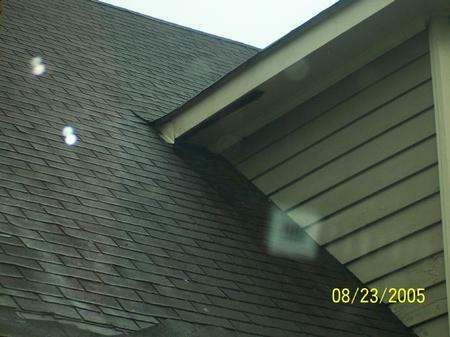 This is the rear dormer and water damage. The soffit will have to be replaced and painted. 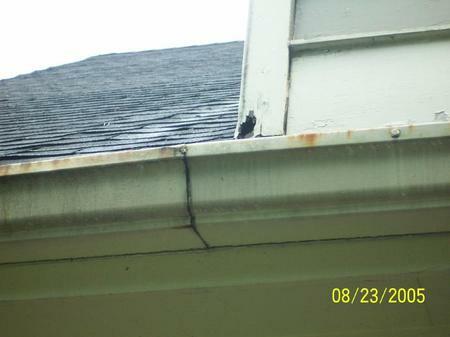 A gutter will be installed along the fascia on both sides of the dormer to prevent this from happening again. I went by the house right after a significant amount of rainfall. I wanted to see what the water was doing and where it was going. 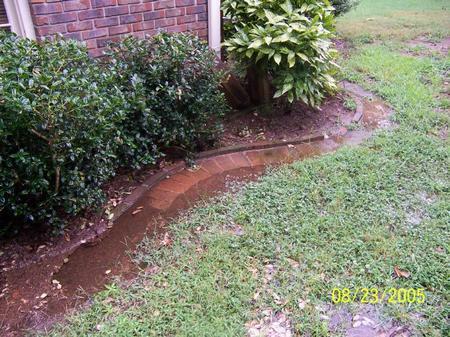 Everything drains away from the house except the back corner where the master bedroom is. 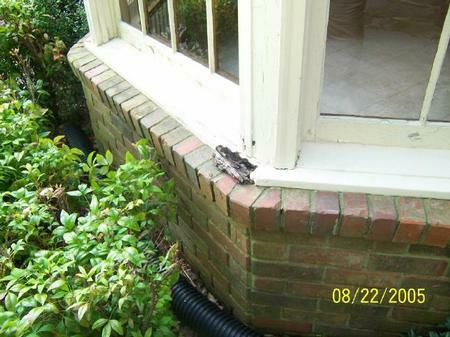 Once that black drain pipe is attached to the downspout (which has come loose) the water will be directed away from this area where it has pooled. 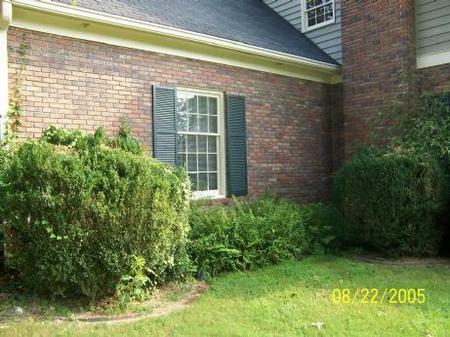 Notice this brick edging to the flowerbeds....it goes all the way around the house. Nice touch, huh? 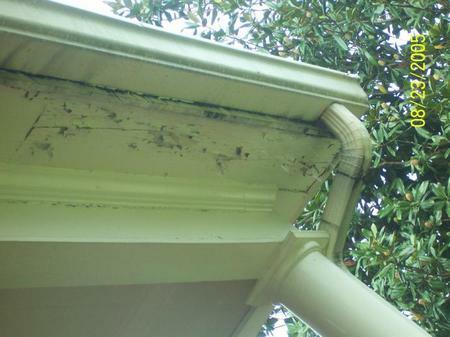 This is the water/wood damage to the soffit and fascia board on the front porch. The damage goes all the way across the entire 40 ft width of the front porch. I've been told that the gutter comes down, the boards come off, boards get replaced, all of it gets painted, the gutters get cleaned out and patched (if needed) and it all goes back up. This is the rotten wood from water damage at the base of the rear dormers. We don't know how much of the siding and trim on the rear upstairs dormer will have to be replaced. Once replaced, it'll have to be painted. If any of the wood siding has to be replaced, it will be replaced with cement siding instead of wood. That will hold up better in the weather and can be painted. We also have to have a garage door along with an automatic opener installed. See where that wooden filing cabinet is sitting? Right behind that is where my new exterior kitchen door will be installed. The window will be closed in so that I'll have an uninterrupted wall in the kitchen for my cooking/baking center. The wall where the hay is to the left of the window will be covered in pegboard. This pegboard will hold all of our tools and yard equipment and act as any additional storage that we may need. I hope to scan and share my kitchen plans within the next day or two. Today I volunteer at J's preschool until 1 pm. I'm waiting on one last price quote on cabinets from a custom shop that does cabinets exclusively . My contractor says that they will beat Lowe's or HomeDepot on price and match them in quality. We'll see. I need to go ahead and get those cabinets ordered because the turn around time is 5-7 weeks and I don't want to be waiting a month on cabinets to arrive before I can move into my new house. 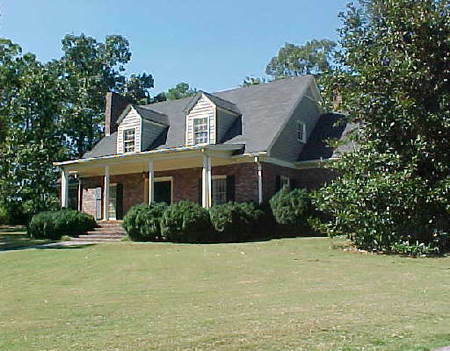 The attorney has the title order and the underwriter has all the information and paperwork. We could close as soon as Sept 12th. The malpractice attorney called today to say that the settlement check would be available on Sept 6th. The withdrawels from our savings for the $20 has been placed and will arrive on the closing date (we just need to call the financial manager and give him a date for the checks to be here). I've got to get working on that moving sale stuff. B has gone through the house here and made a list of all the things that he does "not" want to take with us. Seems that we will be selling a good bit of our furniture here that he has had for years. It was his before we got married and I feel like if he doesn't want it anymore - then he should be able to say that it goes. More this afternoon after I get home and work on the storage unit some. Can't sleep so I'm up making another entry to this blog. I've set one to post later this morning after I've left to volunteer at preschool for the day. 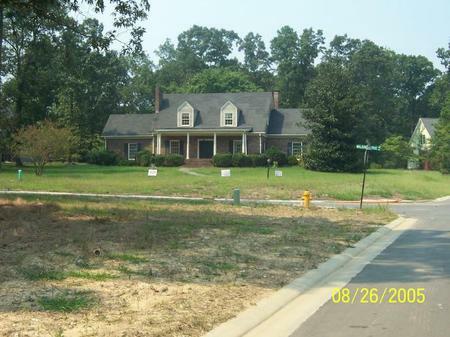 These pictures are to illustrate the landscape and the back of the house. Except for a little bit of poison ivy growing on the west end of the property and some barbed wire left in the leaves on the north (back) part of the property - most of the landscape needs have to do with regular maintenance that has just been neglected for a few years. Once we get in, we'll have to have the edge of the yard (by the side road) graded towards the curb and then seed that area. That's not a 'move in requirement' and a weed eater will have to be taken to that uneven area until some grading and dressing can occur. The boxwoods; however, are another story :) They need trimming but according to the horticulture sites - its is best to wait until much cooler weather. That would be November or December for us. I'm thinking that will fall right in line with when we might have time to address them. Trimming and thinning these shrubs will improve the look of the landscape. It will also make the plant healthier. I'll take the electric hedger and run along the back side of them to make a 1 foot clearance between the shrub and the brick. B wants to trim the limbs of that Magnolia tree (pictured above) to the right (dark green tree that goes all the way to the ground). I'm not sure. It has a significant amount of "stuff" growing under it because the lawnmower can't access the area close to the trunk. One of the things that will have to go is a sweetgum tree that is about 30 inches tall growing under there. I don't like sweetgum trees. Anyone have an opinion on trimming until we have about an 8 foot clearance under that Magnolia? The hole in the bottom right of the picture is where the utilities are connected underground. That hole will have to be filled in and smoothed out. I've never in my life seen the amount of shale that is in this soil. We will not just be able to push it over into the hole - we'll have to use a garden rake and keep resrufacing to remove the shale pieces. I hope my father in law is still speaking to us after we move because he has a resource for topsoil (meaning as close to free as you can get) and we are going to need about 5 tons. I'm pretty confident that come next spring when we lay down some "Weed & Feed" that the lawn will drastically improve by next fall. There are some places that it needs to fill in and some TLC will take care of that. This picture above is the master bedroom window. Lots of work to be done :) There are vines growing all up the exterior of the fireplace (to the right of the picture edge) and those ferns will have to be thinned out. Someone recently suggested to me that once the boxwood are trimmed back and the height lowered that the house will appear taller and more magnificant. I at least want them lower than the top of the porch. 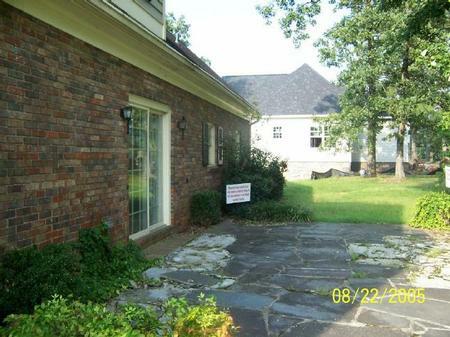 I like that brick edging all the way around the house. For one thing it gives an exact place for the mower and the weed eater to go. I'll want to insert some color in the spring and fall and I need to figure out how I'm going to do that other than some red geraniums on the front porch in planters. I'm not sure that once that Magnolia tree is trimmed to an 8 foot clearance that it would have the same effect with the landscape. I appears to be anchoring the corner of the house right now. What do you think? 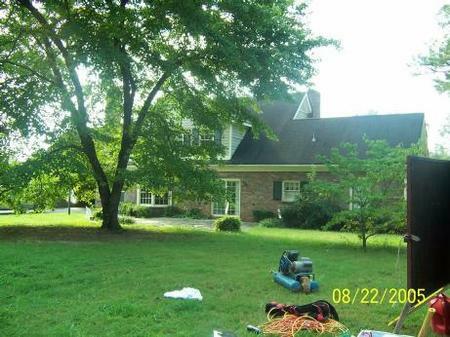 I need some trees in the front yard. I'm open to suggestions. Anything that I choose will need to thrive in full sun because the house faces the south and there is nothing in between us and the sky. I'm thinking a few fruit trees, a crabapple, a flowering pear or two, some red tips along the property line on the west end (between our bedroom and the neighbor's house) and some hydrangeas along the front west corner of the property. 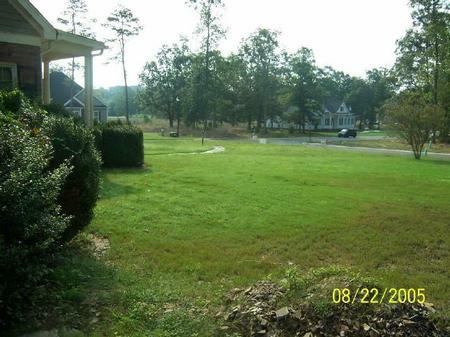 I don't want anything to go in the very center of the front yard because I don't want anything to grow enough that it obstructs the view of our home when you drive in the subdivision. This picture above is the view when you drive in. This is the view from the back right corner of the cleared off part of the lot. There is still an additional 50-60 feet of wooded area behind where I'm standing. The equipment belongs to the house to the right which is still under construction. I wish that the big tree in the center were about 10 feet farther away from the house than it is but this will have to do. I want to wait an entire growing season before I dig into the 4 planting/flowering beds in the back yard. Unless I know that something specifically is a weed - I'll leave it and take note of what it is. I'll document each growing season with pictures so I can include it in my planning. Everything that I've heard about the people who built this house and lived here for 35 years indicates that she was an avid gardner so there's no telling what kind of jewels are hidden beneath that top ground just waiting to peek their heads out to me and say hello. I do need to figure out where I'm going to put a new tulip bed. I'm not bringing my bulbs from this house. There are over 150 burried along the back of my deck here. I will grieve to leave my deck and flower beds but as B so gently put it last night - I can design and create some new ones since I won't have much to do, LOL. I've worked on these damn picture post for over 2 hours but I can't get them to do what I want them to do. I'm going to bed so I don't get more caught up in how negative I feel about them. I'll try again tomorrow morning. This first picture is the view from the foyer looking upstairs. 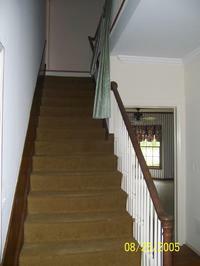 The 2nd picture is from the top of the stairs looking down into the foyer and you can see the front door. There is a catwalk/landing to the left of the stairs. Its 40 inches wide. Here's a better view of the landing. 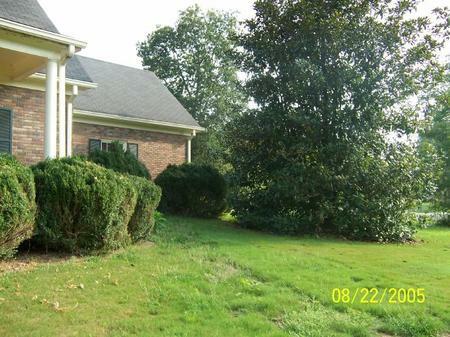 That door is a walk in closet that runs in the roofline along the front part of the house. It is about 8 feet deep and 12-15 ft wide. I can picture some of the quilts that my mother made hanging to the right of the closet door and on the stair wall. This is the view from the door of what will be Baby K's bedroom. This upstairs bedroom and bath is 2 ft square shy of 480 square feet. That open door to the left is another walk in closet. The dormer is 5 feet wide. This is the vanity area to Baby K's room. To the right side of the picture is another closet 8 feet wide and 2 feet deep. I'll need to install some lighting and a mirror above the vanity (which is not pictured but is located right below the bottom left of the picture). 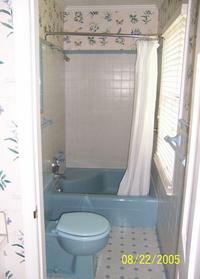 The open door leads to the garden tub and toilet in a seperate area. I don't know if it is visible in the above pictures, but the bedroom and this vanity area both have custom carpets with finished edging on all sides. They fit within 3 inches of the baseboards. The blinds all over the house are the 2 or 3 inch white wood slats. I priced them in the JCPenny's catalog and they are almost $80 each. Every one in the house is in excellent shape and they all are white. Here's that tub and toilet I mentioned in the above paragraph. I didn't remember that I had a picture of this small area. The tub measures 4X4 and can be a tub or a shower. This is the only tub in the entire house. Everything else is a walk in shower tiled from floor to ceiling with doors. I'm not really in love with the color but the tile in every part of this room is in EXCELLENT shape. There are no cracks in any tiles and all the grout is still in prime condition. I could have all this refinished if I absolutely don't want to deal with the blue. This will be J's room. The layout is a mirror of Baby K's room so this corner with the door is another walk in closet. The custom rugs in this room are red, LOL and I'll have to find some colors to coordinate with it. There is a walk-in in the front (pictured here) and another walk in in the wall directly across from the door to the front and then the walk in closet in the dressing area where the sinks are. This is the dressing area in J's bathroom. 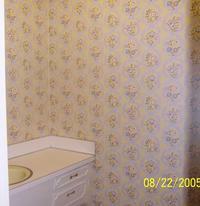 The wallpaper is nicely done but its not for a little boy, is it? We will definitely have to get a different mirror so he can see himself while he brushes his teeth. He is excited because his floor is red and I promised in the smaller walk in closet to make him a "fort". In this fort room I will put glow in the dark stickers on the slanted ceiling and make a pallet in there with a small shelf and a radio/CD player. He can reach the light switch so that is his fort (he says). To the immediate right is the doorway that goes to the toilet and walk in shower for this bathroom. I'm not sure how the decision for the wallpaper was made when it was made because the tile to the shower is a slate grey and the toilet is grey. There is no grey of any whatsoever in that wallpaper stripe or the border. Go figure. And that makes up the upstairs to the house. I realized that I didn't include any pics of the master bedroom in my last post. I apologize. Here is a peek into my dressing closet. I'll be changing the wallpaper as soon as we can. It will have to be taken down and painted before I can install ClosetMaid shelving. 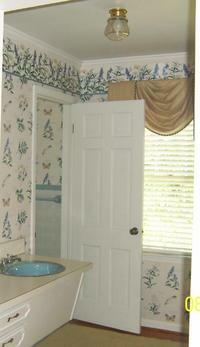 Here is a peek into the doorway of the master bath. Remember those seashell starfish things that I told you about? And how the room is a butter yellow and a deep burgandy color? Following is the view into the MBR from the hallway. While his room is still large, I think it is small by scale to the upstairs bedrooms. ...to see the devistation from hurricane Katrina. Did you see the man (Harvey Jackson) who was trying to save his wife from being carried away by the flood waters? They were on their roof and he was trying to hold onto her and she told him that she knew he wasn't going to be able to hold her and she wanted him to take care of their kids and grandkids and a few minutes later the water took her from his grasp and she was gone. A reporter found this man crying and wondering around in the street and heard him tell his story. Then to see the destruction in Biloxi - that city holds so many fond memories in my heart and soul. Some of the casinos and other businesses were completely washed away. I argued with someone 3 days ago that this weather destroying those businesses was NOT God's way of cleansing the sin from that city. My heart goes out to the people, the families - its almost like 9/11 all over again. TheLoser has family in Slidell and right outside of N'awlins. They were my favorite part of that entire family and my thoughts and prayers have been heavy on them the past 36 hours. I have great friends, a husband and wife pastor team in a Lutheran Church in Gulf Shores - the highway in front of their church was on TV a little while ago and everything is gone. It just breaks my heart to see the waste and how that water and wind just came in and took one huge swipe and the only thing that is left as an afterthought is the debris and tears. Do you roll/hang your toilet paper over or under? What about your toothpaste cap? On or it doesn't matter? Since Saturday afternoon when the acceptance phone call came, my husband and I have been spending a good deal of mental energy working out the strategy to take us from where we are today to where we want to be in 8 weeks. Sometimes it requires thinking forward and sometimes it requires thinking backwards. These are some of the things that will need to be done in the next 8 weeks. They require strategic positioning when relating to the closing date, funding, preparation, etc. Its a double edged sword because we need to close as soon as possible because we can't begin any of the repairs or remodeling until after closing but we can't pay for everything right this week. We don't want to be in the middle of November and waiting to move into our new home. We need for B's clients to pay the remaining $23K that they all owe us. We need for the settlement check to come on through (we expect this to be within the next 10 -15 days). We need for the $20K that we have in savings to be withdrawn and combined with another chunk of change to go towards the down payment. I need to prepare for a moving sale that I'm having Sept. 9th and 10th. Order those cabinets without acquiring anymore debt because we don't want credit card balances to alter our borrowing power. Time this so that the cabinets are set to arrive 1 week after closing. This will give us time to get the current kitchen demolished and prepare for the new cabinets. Install new flooring in the kitchen. Close on the loan as soon as possible so we can begin repairs. Choose paint colors for different areas of the house. (foyer, den, playroom and stairwell will be one same color) (MBR and adjoining hall and closet will be another) I'm not paiting upstairs until in the spring. Select and purchase appliances and sink for kitchen (the only thing we need is an over the range built in microwave and something to cook on/in). We are taking our frig and dishwasher with us. Install a new exterior door from kitchen into garage. 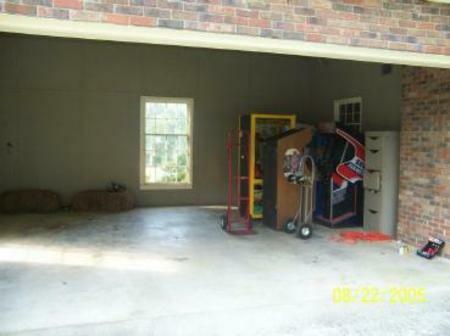 Install a new garage door (with auto opener) in the garage. Close in the kitchen window facing garage. Replace the bay window and extend roof line over window to prevent exterior water damage. Attend a friend's wedding in Wisconsin the 13th - 15th of October. Celebrate Baby K's First Birthday in mid October. That's just a few things that I'm working out. The biggest thing is that we need the music clients to pay. We know the money is coming, but we need it so that we don't have to make purchases on our credit cards. The underwriter of the loan will look at those things and while we will have the budget to purchase all of the things that we will need - we have a bit of a cash flow problem until those music clients pay and the settlement check comes. My biggest immediate hurdle is going through that storage unit and organizing for the moving sale. Pray for funding, pray for clear thought and proper sequencing, pray for patience and for grace. Pray for me to have an attitude so that I can enjoy this process and appreciate the blessings. I'll keep you all posted and share more pictures as I'm able. I'm really looking forward to sharing plans and the "Before & After" on the kitchen. B thinks that I should submit it to the Better Homes & Garden sweepstakes that they have every year. These pictures are of what will be the den or family room. This room is to the immediate left of the foyer when you enter from the front door. This last picture (with the single archway) looks into the foyer and that is the double fronto doorknobs that you see. I'm not too keen on the dark wood paneling and will most likely paint it but I do adore the hardwood flooring. I hope you can tell from the different pictures, taken at different times of the day, how the natural light seems to change the color of the floors. B likes the ceiling beams and I won't paint them - just the space in between. There is no ceiling fixtures so we are going to have to figure out how we are going to instill 2 celing fans in this room without just putting them where light fixtures previously were. The archway (where there is a glass door with beige curtains hanging along side, I think pic #3) divides our family room from what will most likely be our playroom. Once the kids get older, this room will become our music room/library or possibly our formal dining room. It was originally the "den" and the bigger room with the fireplace was the formal living room. You can't see them but that double archway has gorgeous solid wood folding doors that will close off the family room from this playroom. These doors are not like shutters - they are solid panel doors. Through that archway to the immediate right is the doorway that goes into the kitchen. To the immediate left is a 12 foot hallway that begins the master suite. Looking west into the hall towards the MBR, there is a 12' X 8' walk in closet on the left side of the hall. This closet will be mine and it has a sink and counter in the left side (so that sink backs up to the paneling corner in the den by the archway) I'll be able to use that sink/counter as a dressing table and have a place for my jewelry, makeup and toiletries. I will not have to wipe up toothpaste splatters from anyone except myself :) ALL of my clothing (with leftoever space) will fit into this dressing room space. 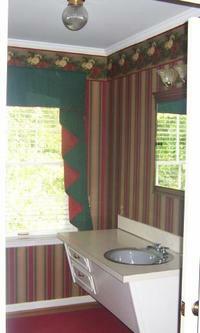 Directly facing the door to this dressing room is the master bathroom. The MBath is on the right side of the hall when looking west towards the master bedroom. 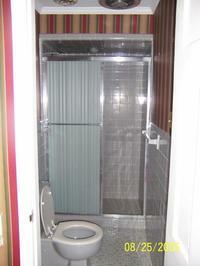 It is a tad bit dated but has a walk in shower 4X6 (big enough for two people) with a seat. All of the grout is still in excellent condition and there is a custom wall to wall carpet with edging on the floor that covers the floor tile. The color is a butter yellow and there are a few "starfish" tiles randomly placed in the wall tile that goes 4 ft up the walls - I'll have to get used to this since I really dislike "ocean" themes bathrooms with shell stuff. This bathroom (the master bath) is the only toilet on the main floor so visitors and family members who don't want to go upstairs will have to use this bathroom. Beyond the dressing closet/room and master bath is the master bedroom. It measures 16' X 13' and has an additional large closet that is 8' X 2'. You may be reaching the conclusion that this house didn't skimp on storage space. you'd be correct-i-mondo. My hubby is very excited about this closet in the MBR because it will be his, all his, and his alone. He even laughed that it is big enough for him to get in (even with all his clothes) and close the doors and still have room. He will not have to pack up his seasonal things every fall and spring and ship them off to the storage unit. Oh! I just realized.... I won't have to pay for that storage unit anymore either. Yippie!! The only drawback to the MBR is that there is only one place that the bed will ever be able to go and I like the idea of being able to change if I wanted to. Obviously, that isn't a deal breaker for me. I'd love to do the MBR in a deep plum and champagne color with white trim. B says he doesn't care as long as he doesn't have to shop for wallpaper or paint colors or accessories. More pics and description(s) to come. When you are planning a trip or vacation - would you like more to just get in the car and see what you can discover and find a hotel along the way or would you prefer to have everything mapped/planned out ahead of time and stick to that plan?